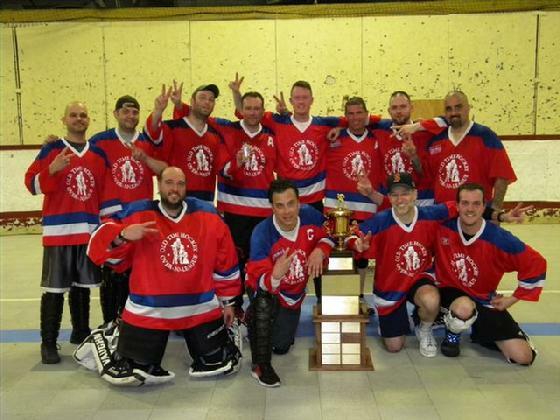 Force of HABit – Champs Again! The spring 2016 Finals featured one team (HABitual Complainers) that was expected to be there against another team (Consigliere) that shocked the Over-30 league by knocking off the number 1 team and crashed the party. During the regular season, Consigliere was the only team that handed HABitual Complainers their only loss during regulation. HABitual Complainers had taken two out of the three games played during the season. The consensus heard around the rink was that HABitual Complainers would keep rolling and easily win this game, taking advantage of their team speed, attacking fore checking game and timely offense. Little did everyone know, that wasn’t how this game would be played out. In the end, it was the Portuguese Power trio that made the difference as HABitual Complainers pulled out a hard earned 2 – 1 win over Consigliere. In doing so, this was the third straight year that the Over-30 league has witnessed a team winning back-to-back championships. HABitual Complainers now joins the 2013-14 Shooting Stars and the 2014-15 Goodfellas teams in making Over-30 league history! As what usually happens in a Finals, both teams came out conservatively, holding back, trying to figure out what the other team was doing. Consigliere did not fore check; rather, they stacked up the center off sides line. HABitual Complainers was forced to play a more dump and chase style as HABitual Complainers was the team that ran more. There was no pace to the start of this game, making it tedious to watch from a spectator point of view as there was no action. Goalies were not tested in this period and it was evident that for this game, the team defenses would dictate the play. An important factor to this game would be which team would score the game’s first goal to set the momentum. That is exactly what defenseman Jason Carrien recognized as the first period was winding down. Seeing the play in front of him from the left point, Jason made a heads up read of the play to intercept a clearing pass, walked down the left wing, and fired a wrist shot past the goalie, giving HABitual Complainers the early lead with only nineteen seconds to play in the period. At the end of the first period, HABitual Complainers had a 2 - 0 lead, but Consigliere had a 6 - 5 edge in shots. The conservative play continued into the second period as neither team changed their playing styles. Consigliere was content to stay back and not fore check, waiting to pounce on mistakes by the defense, while shutting down the running game of HABitual Complainers. HABitual Complainers was trying to press the play with its defense carrying the ball and dumping it in and sometimes chasing in after it. They also were playing very aggressive and physical against Steve Witkus trying to wear him down forcing the other defensemen to step up. As the game wore on, this reporter and others observed seeing defenseman Steve Witkus of Consigliere constantly being left open on the point as HABitual Complainers would pack in their forwards helping out on defense, yet, none of the forwards would get Steve the ball. The other observation made was not taking advantage of Gino Tammaro’s breakaway and game changing speed down the wing to generate a scoring chance to take advantage of defensive mismatches. We finally got to see that late in the second period with just under two minutes to play as Pat Pirone sent a pass down the right wing to Gino who used his speed to get a step on the defense and found a wide open Mike Luise left of the crease, who scored to tie this game at 1 - 1. At the end of two periods, the game was tied, while Consigliere still held a 13 - 12 advantage in shots. Perhaps finally realizing what was at stake here in the third period, and needing to change their style of play, HABitual Complainers started making more plays coming out of their defensive zone and setting up more in the offensive zone. This forced Consigliere to spend more time in their own defensive zone. Both lines for HABitual Complainers found their running game and were right on the defensemen for Consigliere with their aggressive fore checking game. The momentum and carrying of the play was solidly with HABitual Complainers. On the occasional offensive chances that Consigliere was able to generate, their best chance came halfway through the period as Gino was able to run around the defense on the right side deep for a prime scoring chance; however, goalie Jeff Deharo stood his ground to come up with the timely stop. After a big save on a screened Steve Witkus bomb from the point with the period winding down to a minute and everyone sensing that this game was headed to overtime, the Portuguese Power trio made the play of the game. With John Leite along the left wing boards battling the defenseman for possession, he made a smart heads up play to kick the ball up the boards to Dominic Defrancisco who broke down the left wing on a two-on-one with Tony Medeiros. Dominic made a playmakers move by holding the ball looking for the shot and drawing the defenseman over to him, then calmly froze the goalie and slid a perfect pass over to Tony who one-timed it into the net with only fifty-three seconds to play. Consigliere pulled their goalie and pressed for the tying goal only to come up short and end their Cinderella season. The final score was 2 – 1 in favor of HABitual Complainers, who ended up outshooting Consigliere 23 - 17. On the way to the Finals, HABitual Complainers had their hands full with Broken Promises until John Leite’s tying goal early in the third period woke up his team and changed the momentum until Dominic scored the game winner late in the game, pulling out a tough 3 – 2 win. Nick Romano scored both of his team’s goals for Broken Promises. For Consigliere, Gino scored 2-goals, goalie Alby Luise was stopping every shot thrown at him, but, Ray Dow kept Labatt Blues in this game by scoring 2-goals. It was the career highlight goal and move by Steve Oppedisano out front with two minutes to play that was the difference and sent Consigliere into the Finals, with a surprising 3 – 2 victory. 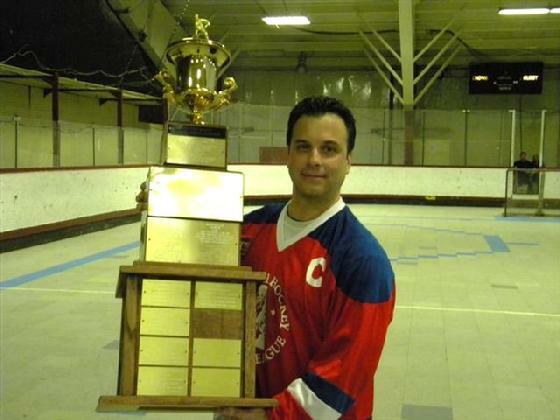 For his efforts throughout the playoffs, defenseman Jason Carrien of HABitual Complainers was named the Playoff MVP. 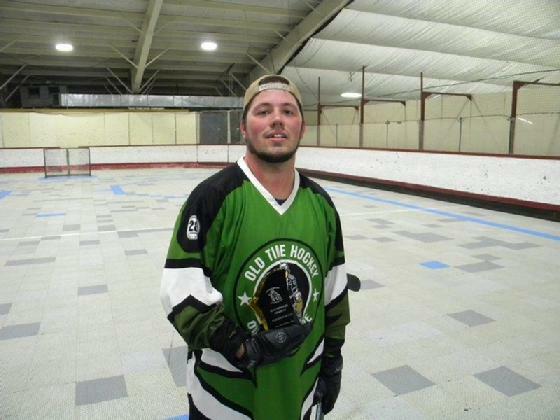 Jason scored the big first goal in the Finals, set up John Leite’s game changing goal in the semi-finals and was the best all-around defenseman throughout the playoffs (while playing with an injured hand). Honorable mention goes to goalie Alby Luise of Consigliere who stopped 54 out of 58 total shots faced (many of them point blank shots and timely saves), shut out the league’s leading scorer in the semi’s, and was a BIG factor in Consigliere’s march through the playoffs. Congratulations to Ed Nigro for moving further into sole possession of first place with the most Over-30 jackets won, winning his 13th jacket. All hail the King of championships! Congratulations to Tony Bono who now joins the select club of “4-peat” jacket winners with Pat Pirone and Jamie Kehoe. Tony will be working out over the summer in preparation of joining that exclusive elite club that no other Over-30 player has yet to join……………the “Drive for 5” club! Congratulations finally to captain Jim Barber who has now done what no other captain has ever done in the Over-30 league, winning back-to-back championships with two different teams (2 of the last 3 years), as well as winning 5 out of the last 7 championships. Impressive! We will let the readers decide if Mr. Let’s Have Some Fun is the greatest captain ever in the Over-30 league. As a team, congratulations to HABitual Complainers for their Spring 2016 championship, whose players include: Captain Jim Barber, Ed Nigro, Tony Bono, Tony Medeiros, Dominic Defrancisco, John Leite, Brian Kehoe, Joe Carlton, Jason Carrien, Jason Glista, Steve Medeiros and goalie Jeff Deharo. Congratulations Jason Carrien on your playoff MVP award. Looks like that CH logo Kellie put on your shirt elevated your game this year! Maybe having some fun out on the rink does actually pay off............Greatest Over-30 captain ever? You decide.